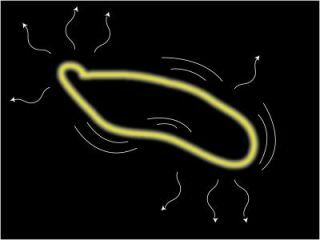 Cosmic superstring loops wiggle and oscillate, producing gravitational waves, then slowly shrink as they lose energy until they disappear. The hunt for elusive gravitational waves has a new target: singing cosmic superstrings that theoretically emit the long-sought waves as they vibrate. The superstrings are "so light that they can't have any effect on cosmic structure, but they create this bath of gravitational waves just by decaying," said Craig Hogan, a cosmologist with the University of Washington (UW). Gravitational waves, ripples of gravity caused by moving matter as it warps the fabric of space and time, were first theorized by Albert Einstein in his theory of general relativity in 1916, though the phenomena have yet to be observed in real time. String theory posits that hidden dimensions are tightly wound in strings of elementary particles. An offshoot of this theory suggests that some such strings can form into narrow tubes of energy stretched across vast distances by the expansion of the universe. These theoretical cosmic superstrings, which researchers described as ultra-thin tubes filled with ancient vacuum created in the early universe, can coil into galactic-sized, vibrating loops that emit gravitational waves as they decay into oblivion [graphic]. They might also be detectable using the Laser Interferometer Gravitational Wave Observatory (LIGO) or NASA's proposed Laser Interferometer Space Antenna (LISA), Hogan added. "Sensing these vibrations would add the soundtrack to the beautiful imagery of astronomy that we are used to seeing," Hogan said. "All this time, we have been watching a silent movie." Hogan and Matt DePies, a UW doctoral student and visiting physics lecturer, presented calculations for cosmic superstring-generated gravity waves last week at a meeting of the American Astronomical Society in Seattle. Since gravitational waves are thought to be extremely weak, cosmologists believe that only those generated by massive collisions will be strong enough to be observed. A black hole smash up, for example, could spew waves of up to a million times the more power than those produced by every galaxy in the universe, researchers said. Hogan added that while some gravity ripples could occur at frequencies perceptible to the human ear, many sources are likely to have extremely low frequencies of 10 to 20 octaves below the range of human hearing. "If we see some of this background, we will have real physical evidence that these strings exist," Hogan said.